It’s April and you know what that means: the hottest temperatures have arrived. And while the scorching month still lasts, take advantage of the hot season by gorging on any special iced-down dishes the city has to offer. The first cool slash drool-inducing thing that springs first to our minds when talking about cold food, however, is khao chae. It’s a delicacy brought to us by the Mon people, an ethnic group from Myanmar that relocated to Thailand during the era of King Rama II. 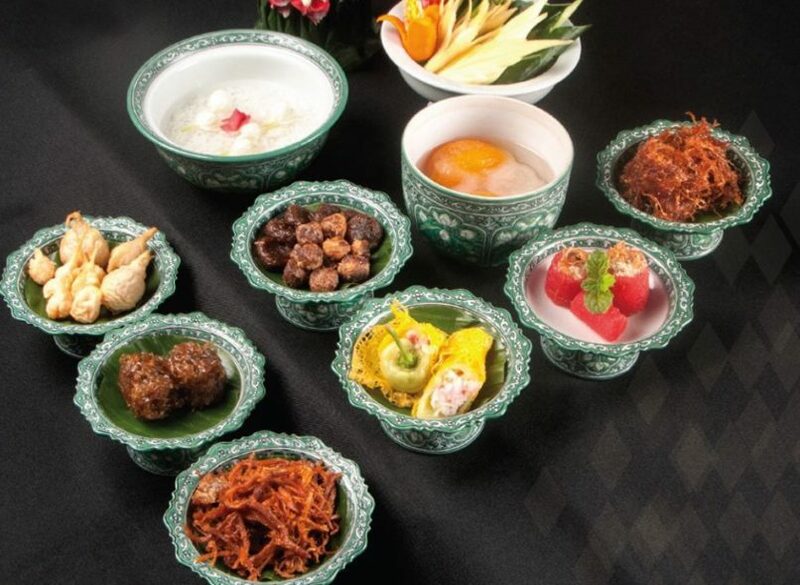 Translated as soaked rice (khao means rice and chae means soaked), a khao chae meal typically features a bowl of rice showered in flower-scented cold water and side dishes that are to be eaten with the rice. Normally seen during the Songkran period, khao chae then became associated with the water festival of Thailand and has also become one of the most iconic items to be eaten during the Thai summertime. So if you and your family are spending the summer days in the city this month, we’ve found 5 of the best places to have khao chae. It’s that time of the year where you should be pleasing your parents or family with traditional Thai tastes to celebrate the Thai new year in the most celebratory­ and delicious of ­ways. It’s hot outside and you know you need a cold, restorative meal by the river to freshen your day up a bit. So hit up Thiptara, a riverside Thai restaurant within The Peninsula Bangkok to gorge on their scrumptious khao chae set, which is composed of steamed rice soaked in jasmine water, sweet dried fish, shredded beef or pork, stuffed shallots with fish, sweet dried turnip, stuffed sweet chilli with shrimp and pork, crafted green mango and galangal. When: 1-30 April. Serving Mon-Sun, 12-2:30 pm. Price: THB 1,119++ per person for Mon-Sun (THB 766++ for kids) and THB 1,354++ per person for Sat-Sun (THB 942++ for kids). 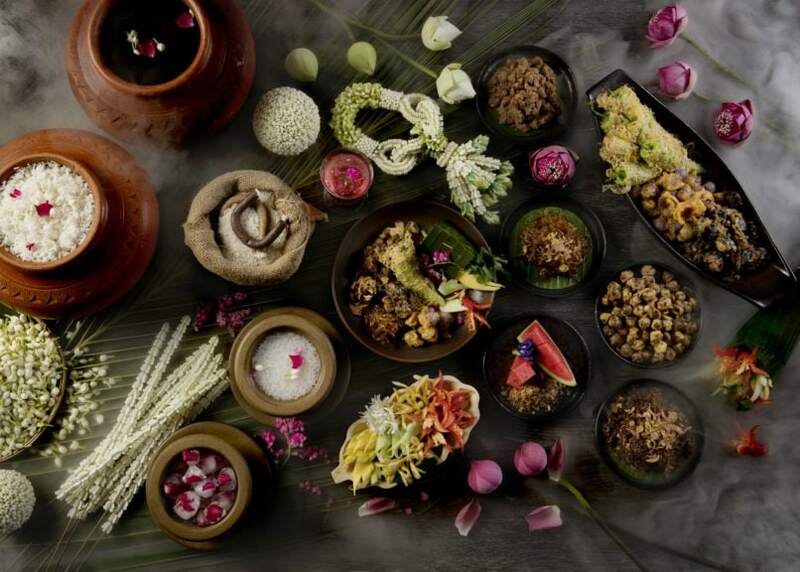 Bless your summer dinner table with special khao chae from the Mandarin Oriental Bangkok. 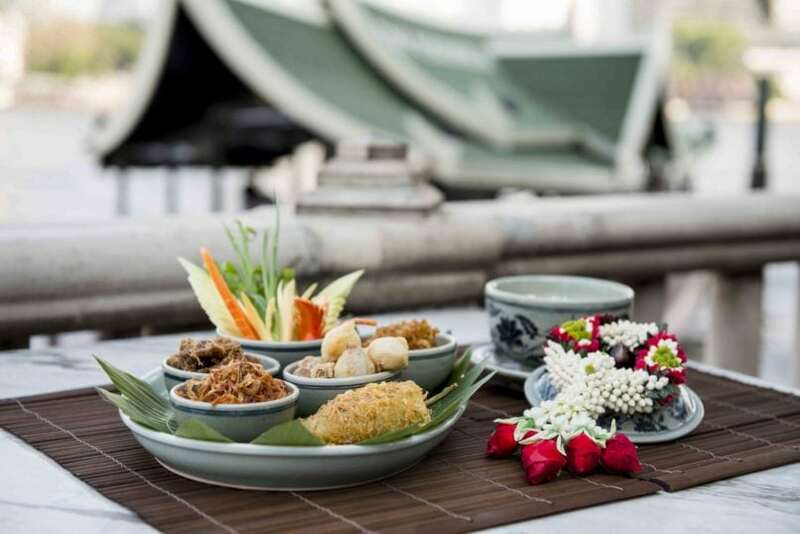 The hotel is now having their takeaway khao chae set available throughout Mandarin Oriental Shops in Gaysorn Village, Central Chidlom, Emporium Shopping Complex and Siam Paragon. But if you’d prefer to have it in their sleek hotel setting, head over to Sala Rim Naam, a Thai restaurant within the venue to feast on their drool-inducing khao chae served during the buffet lunch. 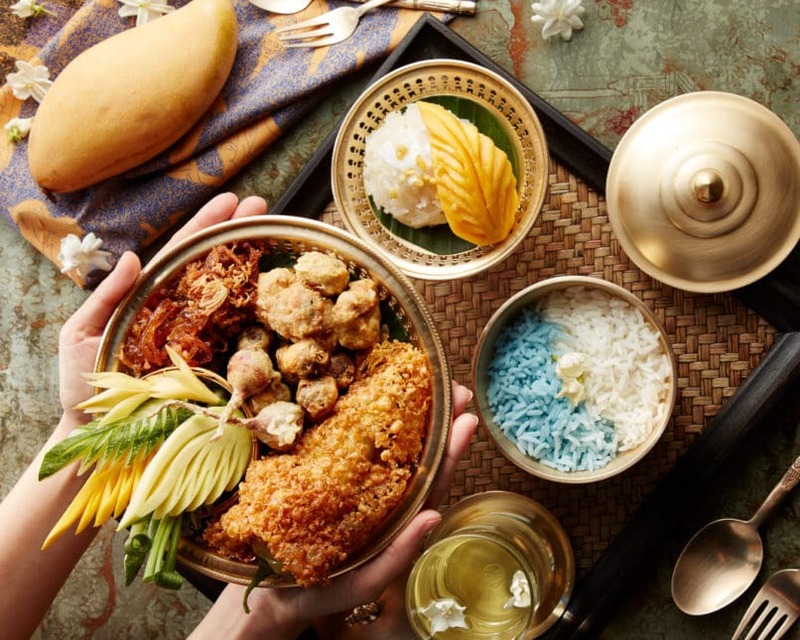 Featuring jasmine-scented rice, fried sweet peppers, battered salted eggs, stuffed shallots, fried shrimp paste, sweet fish, salty beef and pickled vegetables, diners can take comfort in their extensive list of khao chae elements as well as enjoying a wide selection of quality buffet items. Open: Mon-Sun, 12-2 pm for lunch and 7-10:30 pm for dinner. When: 1 April- 31 May. Serving Mon-Sun, 11:30 am-5 pm. Price: THB 490++ per set and THB 590++ for a take-home order. 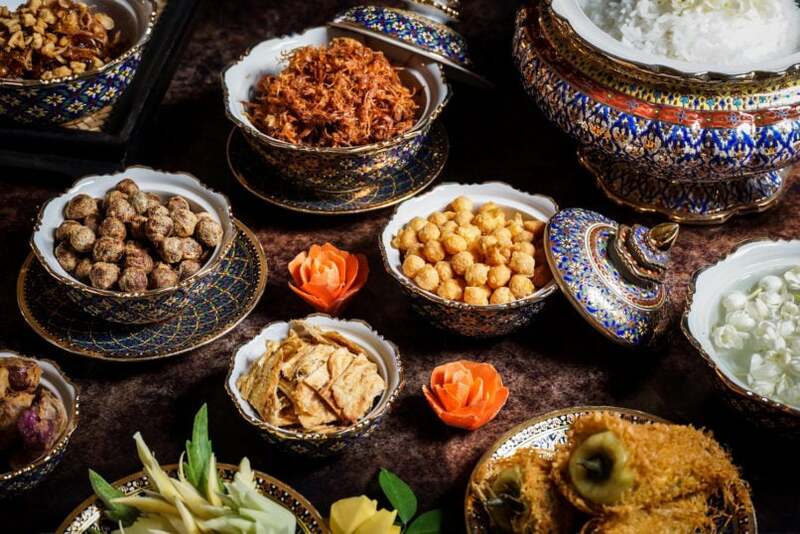 Siam Tea Room and Goji Kitchen + Bar within Bangkok Marriott Marquis Queen’s Park brings Thai summer on a plate this month with the Khao Chae Chao Wang (royal-style khao chae) set. So fill your summer days with joy through their jasmine-scented rice served alongside seven delectable condiments like deep-fried kapi balls (fermented shrimp paste), bell pepper stuffed with seasoned pork and shrimp, pork floss cooked in caramelized sugar, sweet and salty stir-fried turnip, crispy shrimp-stuffed butterfly pea flowers and more. Made after the original version which was first created at Ratchaburi, the khao chae served here is as original as it gets. Price: THB 550++ and THB 850++ for takeaway. Go here for silk and stay for a treat. This month, march your way towards the Jim Thompson Restaurant at Jim Thompson House Museum and Bombyx Jim Thompson within Siam Paragon for a cooler meal of “Khao Chae Jim Thompson.” The silk-focused brand brings Thai traditional summer food to the table, showcasing the two-tone chilled floral-scented rice coloured with natural flowers along with a lavish array of six side dishes, for example, fried shrimp paste balls, stuffed green peppers, fried stuffed shallots and stir-fried sweet spotted eagle ray. For dessert, it’s mango and sticky rice to cap off the meal right on a fresh and fruity note. Open: Mon-Sun, 10 am-5 pm for lunch and 6-10 pm for dinner. Price: THB 990++ per set and THB 1,250++ for a takeaway set. Celadon within The Sukhothai Bangkok is a restaurant that turns Thai food into a sophisticated tasting menu that still stays true to the traditional ingredients and flavours. The venue invites you Thai food devotees over this summer to bask in the joy of khao chae curated by their creative-minded Chef Rossarin. Those looking for a special Songkran dining experience in an exclusive, fine-dining setting, Celadon should be one of your top choices. Open: Mon-Sun, 12-3 pm for lunch and 6:30-11 pm for dinner.